As a Portland periodontist, one the questions our team at Portland Periodontics hears most often from new patients is how do we differ from a family dentist? A family dentist helps to protect the health of your teeth and gums by providing preventative services such as dental exams, cleanings, sealants, and fluoride treatments. They also typically offer cosmetic dental treatments like teeth whitening that are designed to help improve the appearance of your smile, and restorative care that helps to repair a smile damaged by neglect or decay. At Portland Periodontics, however, we specialize in the treatment of periodontal disease in Portland, OR. disease causes gums to become inflamed, swollen, red, and to bleed easily, especially after brushing and flossing. If left untreated, gingivitis can progress into the more serious periodontitis, a severe form of gum disease that ranks as the leading cause of adult tooth loss in the U.S.
By now, most of us understand the risks associated with not brushing and flossing daily. Plaque, a sticky biofilm made up of harmful oral bacteria and food particles that linger in the mouth after eating, breaks down the sugars in the foods and drinks we consume to produce harmful acids that slowly erode tooth enamel and cause gum inflammation. Unfortunately, understanding the risks that come with poor oral health doesn’t always translate into taking our oral hygiene seriously enough. Over 47 percent of adults 30 and older in the U.S. suffer from some degree of periodontal disease, according to the Centers for Disease Control and Prevention. The risk of gum disease only increases as we get older, as over 70 percent of adults age 65 and older suffer from the disease. If periodontal disease only impacts the health of our teeth and gums it would already be a serious cause for concern. But recent research into the disease suggests that periodontal disease could have far more of an impact on our health than many people realize. Over the last 10 years, a growing amount of research has found an association between periodontal disease and a number of serious, long-term health problems. Studies have found that individuals who suffer from tooth loss and periodontitis have a significantly higher risk of developing such chronic health issues as heart disease, stroke, arthritis, dementia, diabetes, obesity, and cancer. So what connects our oral health to our overall health? Well, researchers aren’t entirely sure. So far they have found an association between our oral health and overall health, but no clear cause and effect connection. This, however, has caused researchers to hypothesize on a potential connection. One of the most prominent theories suggests that harmful oral bacteria enters the bloodstream through cuts in gum tissue caused by periodontal disease. Once in the bloodstream, these bacteria travel throughout the body causing inflammation – such as in the heart and joints – wherever they go. This inflammation then becomes the root cause of the systemic diseases mentioned above. 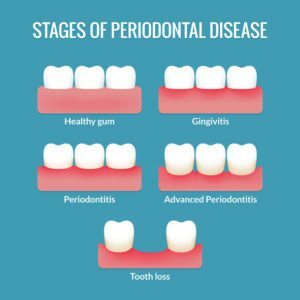 While further research is needed to develop a better understanding of this possible connection, it has become clear that treating and preventing periodontal disease is an important part of protecting our long-term health. That’s where Portland Periodontics can help. At Portland Periodontics, we offer a comprehensive range of services designed to help treat periodontal disease no matter the stage or severity. From root scaling and planing to bone and gum grafts, our experienced Portland periodontist can help restore your smile back to health. Of course, ideally, we’d never need to have patients visit our office in Portland for dental implants, root scaling, or any of the other services we provide. However, if you do need to see a Portland periodontist, it’s important that you receive treatment sooner rather than later. Allowing gum disease to progress only makes it harder to reverse the effects of the disease and to restore your oral health. Getting timely care is easier when you understand the potential signs of the disease. If you suffer from any of the warning signs or risk factors mentioned above, it’s important that you receive regular dental exams and cleanings to lower your risk of periodontal disease. Remember, prevention is always a better option than treatment. Help to lower your risk of periodontal disease so you can enjoy a lifetime of better oral and overall health.